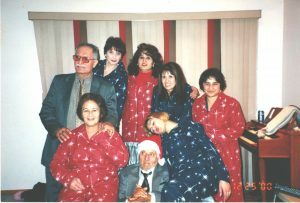 Margaret Petros’ family is Assyrian Christian and they noted ominous changes soon after Saddam Hussein took power in Iraq. At school Margaret had been in a class on Christianity while her Muslim classmates attended a class on Islam, but suddenly the class in Christianity was cancelled and she was given a Koran to study. Neighbors were fleeing in the night and soon Margaret’s family arranged their own escape. Her boyfriend in Iraq stayed until two wars later.